Warsaw is a popular city to travel to, for many excellent reasons. Its long history and fascinating culture welcome all who wish to learn more about it, not to mention the delicious traditional cuisine. Also, it is getting increasingly easier for tourists from all across the world to travel to this metropolis full of hidden treasures to explore. But there are still quite a few fantastic, and historically significant places that are famous among locals, yet often overlooked by this city’s overseas visitors. Let’s learn more about some relevant places you can visit while on a tour to Eastern Europe. This baroque palace, completed in 1969, is located in the beautiful Nieborów, in the outskirts, just 85km from Warsaw’s center. It is very popular among locals and tourists from the neighboring countries, but this lovely site deserves far more overseas visitors. It changed several owners and underwent several renovations, but the aristocratic Radziwiłł family took ownership in 1771 and lived there the longest, until 1945. Today, the museum encompasses beautiful apartments, decorated with marble and mahogany, where you can see various collections of priceless ornaments, furniture, sculptures and figurines, family portraits, porcelain, etc. The palace is surrounded by English-style landscape, stables, orangeries, courtyards, conservatories, and splendid formal gardens. Arkadia village is just 5km away from Nieborów Palace, and it is open every day. It is a gorgeous, romantic park founded in 1778 by Princess Helena Radziwiłłowa, filled with greenery, flowers, a lake with two islands, and a number of pavilions designed on historical or mythological themes. Truly a sight to behold. Statues should never be overlooked because they are reminders of great people and events, and each has a magnificent story behind it. If one is to choose just two monuments to visit in Warsaw, it would have to be those of Maria Curie and Frédéric Chopin, both heroes of this city. Curie, born in Warsaw, was the first woman to win the Nobel Prize and is still the only woman to win it twice, and in two sciences (physics and chemistry). She loved walking along the Wisła River since she was a child. She wrote: “There is a song from Kraków that says, whoever has fallen in love with the Polish waters, will love them until death. [...] The river is so enchanting, that I cannot even begin to describe it.” Today, a statue of Skłodowska-Curie stands in Warsaw’s New Town, looking towards the Wisła River. While in Warsaw, make sure to see the most famous statue in the world dedicated to Frédéric Chopin. When the monument was unveiled in 1926, its design was considered controversial. It was soon destroyed by the Nazis in 1940, who saw it as a powerful symbol of the resilient Polish spirit. 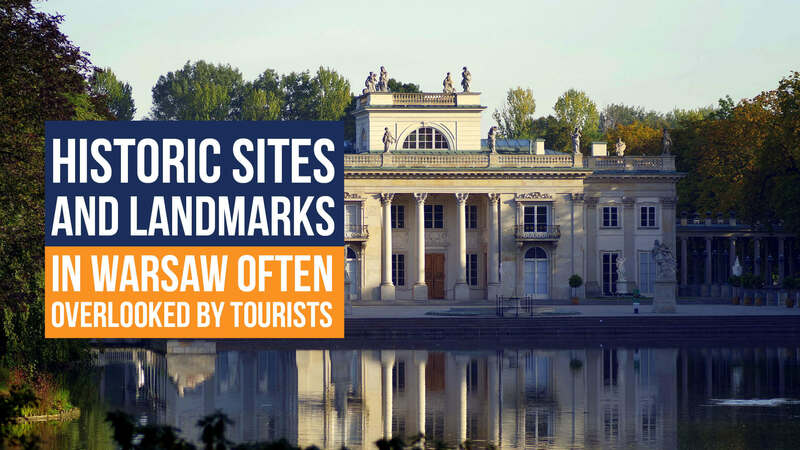 It was rebuilt after the war, and now it proudly stands next to a lake in Warsaw’s most famous park, the Łazienki Królewskie. On Sundays during the summer, visitors can listen to Chopin’s music being played next to the statue. The Warsaw Fotoplastikon is a stereoscopic theatre based on the Kaiser-panorama system of rotating stereoscopic images. It is the oldest such theatre in Europe. First opened in 1901, it moved in 1905 and still stands at that same location. Just before the era of cinema, the Fotoplastikon was basically Poland’s first 3D theatre. Viewers sit around the circumference of the machine and look through one of 24 viewports, while stereoscopic slides appear for 15 seconds each, accompanied by a brief written description and theme-related background music. Having survived two world wars and Soviet control, and once being a meeting spot for dissidents and revolutionaries, for the people of Warsaw, the Fotoplastikon was always an exceptional, powerful place that demonstrates strong Polish spirit. Run by the original owner’s grandson, it is still open and remains a popular meeting spot for Varsovians. Even though not in Warsaw, this is a place that should not be missed while in Poland. Located on the outskirts of Lublin, southeast of Warsaw, Majdanek concentration camp is a site of the tragedy that must never be forgotten or overlooked. Around 80,000 Jews, as well as gypsies and Soviet prisoners of war, were murdered there during WWII. Today, it is a museum that serves as a reminder of war atrocities, telling its tale to all who visit it to learn about its history and to honor the victims. It was the first museum of its kind in the world, and it performs numerous important tasks, such as scholarly research into the Holocaust in Poland. It is home to a permanent collection of rare artifacts, testimonies, and photographs. In the early 2000s, a new obelisk dedicated to Jewish victims of Erntefest was erected. Also, a new branch of the Museum was inaugurated at the Belzec extermination camp nearby, and new items were unearthed at the campsite, buried by Jewish prisoners in 1943. In 2009, the Majdanek Museum was awarded the Gloria Artis Gold Medal for outstanding contributions to Polish culture.